It would be impossible to trace the entire history of writing in this space. What we can give is a general overview of the history. Our alphabet of 26 letters is the result of centuries of changes in writing. Many of our letter shapes, in fact, originated with Egyptian hieroglyphics. The letter "A" for example, was pictured as an ox in hieroglyphics. 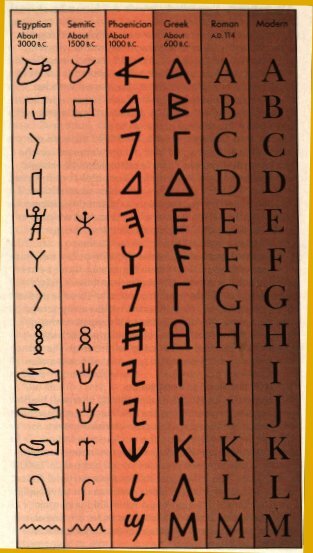 The chart below shows how some of the letter shapes developed from hieroglyphics into the modern forms. The alphabets listed on this chart are the ones of greatest historical significance. As you can see from the chart above, our current alphabet is essentually Roman. For the calligrapher, the most interesting periods in history are from the Roman period through the Renaissance (100-1600 A.D.). It was during this time, that the pen-lettered alphabets that we study and use today were developed. The major alphabets from that time span (in chronological order) are: Roman, uncial, blackletter, italic, and bookhand. Each of these 5 has numerous variations, and it is from these 5 alphabets that most of the modern type-faces or fonts are derived. 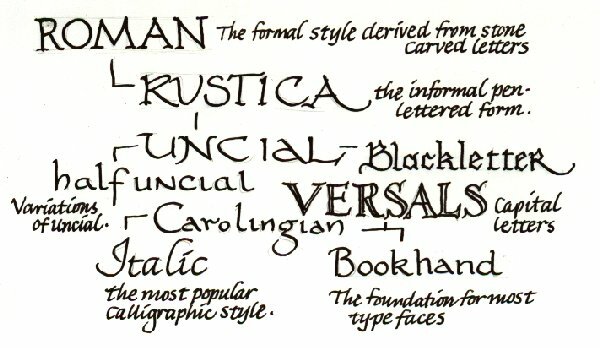 The illustration above is a very quick sketch of how the most popular calligraphic styles are related to one another stylistically and chronologically. If the history of writing interests you, you will find more information in Edward Johnston's Writing and Illuminating and Lettering. Johnston is considered by many to be the "father" of modern calligraphy.